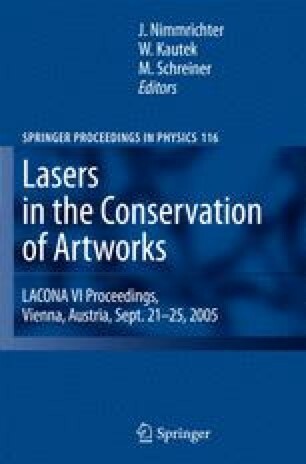 Lasers have been tested, during the recent past, as a useful cleaning method in conservation treatments: this is due to selectivity and precision of its performance. Nevertheless some colour changes have been detected using Nd:YAG laser sources, especially on white and red coloured substrates. Colour changes on white marble and other white architectural materials have already been widely surveyed. This chapter focuses on the interaction of laser radiation with two kinds of red materials: red Verona limestone and terracotta. These materials have been chosen because of their large use in northern Italian architecture and in statuary. Red Verona limestone is not homogenous in hue, owing to the presence of calcareous nodules (lighter in colour) and clay veins (dark reddish colour).